When night falls on the city of Los Angeles, another world comes to life in the industrial wasteland on the edge of town. In the faint afterglow of the setting sun, the young, the beautiful, and most of all, the fearless, take to the streets and wait in anticipation of the night's festivities. Out of the gloom they appear, the so-called 'rice rockets', souped-up Asian imports custom-built for only one purpose-- such that the wielders of these modern-day chariots can leave everyone else in the dust once the flag drops. Welcome to the illicit world of import car street races where director Rob Cohen ("Daylight") sets the stage for "The Fast and the Furious". Unfortunately, when the characters aren't hurtling at high-speeds in the film's surprisingly-decent action sequences, this no-brainer actioner feels more like 'the slow and the tedious'. The 'king' of these races is Dominic Toretto (Vin Diesel of "Pitch Black"), whose high-performance racers and top-notch crew have won him many a race. 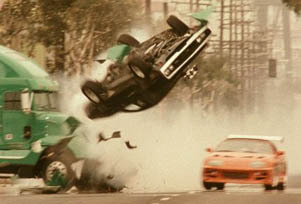 In the aftermath of a race that is rudely interrupted by the police, Dominic finds himself saved from the slammer by a cocky newbie named Brian (Paul Walker of Cohen's last feature, "The Skulls"). Impressed by what he sees, Dominic invites Brian to hang with his racing crew as it prepares for an upcoming event known as 'Car Wars'. Unfortunately, what Dominic doesn't know is that Brian is actually an undercover cop who is investigating a number of high-profile tractor-trailer hijackings. Some of the ill-gotten gains from these hijackings have made their way to the street races, and it's up to Brian to figure out whether it is Dominic, or Dominic's biggest rival, Johnny Tran (Rick Yune of "Snow Falling on Cedars"), who is behind these crimes. Of course, things get complicated by the rapidly-intensifying rivalry between Dominic and Johnny, as well as the blossoming relationship that Brian develops with Dominic's younger sister Mia (Jordana Brewster of "The Faculty"). And as time runs out on his investigation, Brian must close the case, which could possibly mean busting his new best friend, the big brother of the woman he loves. What Cohen has done in "The Fast and the Furious" is essentially create a reasonable facsimile to the quintessential Hong Kong action movie. 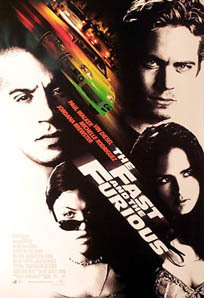 Aside from a preponderance of Asian faces on the screen, by combining MTV-school-of-filmmaking cinematography, the import car racing subculture, a police procedural examining the conflict between loyalty and duty, and some gunplay (including "SDU"-type SWAT-team action), "The Fast and the Furious" could have easily rolled off the Hong Kong action movie assembly line. On the basis of its action sequences alone, "The Fast and the Furious" is the movie that last year's mediocre "Gone in 60 Seconds" should have been. In addition to some engaging and visually-enhanced racing footage, "The Fast and the Furious" also throws in what is probably the best 'tractor-trailer vs. car' action since 1997's "Breakdown". Unfortunately, when the characters get out of their cars, the written-by-committee script is just as shallow as the quintessential Hong Kong action movie, rife with banality and exploitation (most notably of the female kind). The film's opening is perhaps the most difficult to sit through, as the poorly-developed characters spend most of their time shouting at each other and exchanging dirty looks. Later on, as the story's potential for drama escalates, opportunities to examine the internal conflict brewing within Brian are wasted as he ends up doing some fairly silly things that strain the credibility of his character. Thankfully, these plodding 'character moments' are somewhat tolerable as they are bookended by the raucous action sequences. Given the superficial treatment of the characters, the performances are all over the map in "The Fast and the Furious". The most interesting actor on the screen would have to be Vin Diesel, who manages to rise above the material with his charisma and commanding screen presence. In comparison, Paul Walker, as the film's hero, is rather bland and doesn't do a convincing job of conveying the inner turmoil that supposedly occupies his character. Michelle Rodriguez plays the same tough Latina that she did in last year's memorable "Girlfight", only without the benefit of a role or dialogue worthy of this up-and-coming actress' talents, while Jordana Brewster is passable and pleasing to the eye as the resident love interest. Movies involving fast cars have been relatively disappointing of late. Last year's "Gone in 60 Seconds" offered too little too late, while this year's "Driven" never managed to pull out of the slow lane. Though "The Fast and the Furious" is just as empty-headed as its predecessors, it does deliver the thrills that promises-- and even manages to be occasionally fun.